Robbie W. Smith, M.A. Counseling Psychology, is a Florida Licensed Mental Health Counselor, and she holds an Honorary Doctor of Ministry degree from Southeastern Theological Seminary Jacksonville given for her service and knowledge of Christian Ministry to children and families; she holds two earned Master’s, one in Christian Counseling from Southeastern Theological Seminary Jacksonville and a second in Counseling Psychology from the University of North Florida. Robbie has served multiple professional organizations in an official capacity including Treasurer of the Northeast Florida Mental Health Counselors Association. 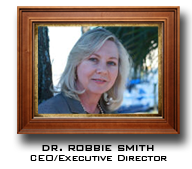 She was Treasurer for the Florida Association of Christian Child Caring Agencies from 1991 to 1994, served as President of FACCCA from 2005-2008 and is currently serving on its Executive Committee. Robbie with her husband Doug, co-founded the Safe Harbor Boys Home program in 1983, it was incorporated in 1984 as a not for profit organization to care for fatherless, at-risk, abandoned and/or orphaned teenage boys. The facility has operated for 25 years without accepting government funding for support. Robbie serves as the Executive Director in a volunteer capacity. Robbie, along with her husband and Safe Harbor has been profiled nationally in People Magazine, World Magazine, and on CBS This Morning, NBC News Today, CNN, and CBN. Robbie was featured as the cover article in the University of North Florida Alumni Journal in September 1996. A movie based on the true story of Doug and Robbie’s life aired May 30, 2009 on the Hallmark Channel. The movie stars Treat Williams as Doug and Nancy Travis as Robbie.